Sưu tầm – What’s the future of Blockchain? A blockchain is a record-keeping mechanism. In that sense, it is simply a 21st century version of the recording systems that have been around since people started chiselling marks on cave walls. Over the millennia we have moved from ledgers that are carved into clay and stone to ones that are digital. To be more specific, consider the problem of tracking the ownership of a share of equity in a particular company. Imagine that there is a sequential list of all owners of that share, with the name of each former owner crossed out. The last one at the bottom of the list is the current owner. The key question is the following: who has the right to cross out that last name and to write in a new one? Put another way, the challenge we face is to create a tamper-proof and universally accepted way of recording things like ownership of assets, obligations of one person to provide a product or service to another, levels of inventories, personal identities, and the like. Having a secure and trusted mechanism for accessing and changing those records is essential if our economic lives are to function smoothly. Most people will care little about the details. What we require is that the system be reliable and that it cannot be hijacked by someone with ill intent. This two-by-two classification system leads to four possibilities that distinguish the various ledger frameworks. To understand this taxonomy, consider the following two tables, which provide a set of nonfinancial and financial examples.1 It is worth going through each of the four cases separately. 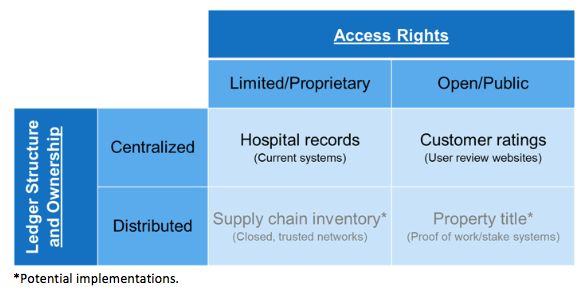 The upper-left cell of each table is the case of a centralised database with limited, proprietary access rights. This portion of the taxonomy pretty much captures the ledger practices of human civilisation until now. That is, there is one central ledger that contains the authoritative record of ownership or obligations and can only be changed by the organization or person maintaining it. Those authorised not only have the sole right to make changes, but may also control who can view the entries. While there may be copies, there is only one definitive version. Examples of this are easy to find – hospital records and records of securities ownership are just two. Turning to the top-right cell of each table, this is the case of an open-access but centralised recording system that allows anyone to write and read. Since there is little or no security, this mechanism is of fairly limited use. Nevertheless, examples exist. In the nonfinancial realm, these include the customer rating systems employed by Amazon, eBay, TripAdvisor, and the like. It also is the mechanism that Wikipedia uses for creating and updating entries. Given the security concerns, financial examples are more difficult to find. We can think of one instance of wide use – the Consumer Complaint Database of the Consumer Financial Protection Bureau (CFPB). The bottom row of each table covers the range of distributed (or decentralised) databases. The distinction here is that there are now many copies of the ledger, and they all have equal standing. Furthermore, anyone who has one can change it, so long as they follow an agreed set of rules. Put another way, participants directly interact with each other. And, as with the centralised systems, there can be two cases: proprietary with limited access, and open and permissionless. Blockchain technology is designed to implement distributed systems. It does this by providing automatic mechanisms that create trust, ensuring there are no conflicting changes, and preventing malicious actors from making unauthorised or improper changes. It has the potential to record transactions between two parties, maintaining an agreed sequence, without reliance on costly third-party verification. To prevent people from arbitrary attacking the system, violating trust, and making illegitimate modifications, the ability to alter the ledger is based on a scarce resource. In the closed, permissioned model, the scarce resource is identity– only specific people or institutions with particular attributes are authorised to make modifications. The idea of an open, permissionless system is to make identity irrelevant – anyone can join, leave, and re-join as often as desired. In this second case, the scarce resource that allows one to alter the ledger can be something like computational power or a stake (possibly financial) that someone has in the system. In the open system, participants are allowed to make changes so long as they follow the rules. Importantly, the rules must be designed to prevent a bad actor from capturing the system. The original Bitcoin protocol, where the scarce resource is computational power, is immune from takeover so long as no one controls more than half of the computing power. But, as has been pointed out repeatedly, Bitcoin is incredibly resource intensive. Electricity cost alone exceeds $3 billion per year. In economic terms, this is a pure deadweight loss. In environmental terms, it is a disaster. Both financial and nonfinancial uses of blockchain technology remain limited, with the obvious exceptions of cryptocurrencies. In the first table, we have listed two possible nonfinancial applications– supply chain inventory management and property title records– but so far as we know, neither of these has yet been implemented on a broad scale. Where is this all heading? Without a further theoretical breakthrough, open distributed systems appear both costly and slow. Estimates for the Bitcoin protocol, for example, are that speeds cannot exceed seven transactions per second. In contrast, there may be some promise in distributed systems that are proprietary. We suspect that most of the corporate developers working on such projects have this kind of architecture in mind, perhaps in the hopes of creating a profitable monopoly. Unfortunately, a monopolist would be unlikely to lower transactions costs in the way that the advocates of open distributed systems hope. In the world of finance, one proprietary example is CLSNet, a bilateral payment netting solution that lowers foreign exchange transactions costs using distributed ledger technology. Conceivably, a blockchain system could securely track the ownership of every financial instrument and exposure in the global economy. While this is a very tall order, it would be truly revolutionary. Money laundering and terrorist finance would be much easier to police. Authorities could monitor position concentrations and systemic risk. And, financial market participants could overcome information asymmetries, improving risk pricing and capital allocation. In practice, we are still a long way off. For example, before we can map the entirety of the financial system, we need to be able to identify both entities and instruments. We have written about the virtues of the Global Legal Entity Identifier(LEI) and the importance of universal adoption (Cecchetti and Schoenholtz 2017b). But a complete mapping also would require global financial instrument identifiers (FII). While the LEI process is now well advanced, as far as we know, no one has plans to implement FIIs. Ultimately, such a transparent financial system would be a world without privacy. Suppose, for a moment that LEIs and FIIs were all in place and that everything was recorded on a proprietary distributed ledger that the public can view (perhaps for a fee). This would mean that everyone’s balance sheet and transactions will be public. Even if a much less invasive version were to become possible, it would be deeply ironic if blockchain, a technology initially championed by libertarians disenchanted by government and fiat money, ended up by narrowing the range of individual freedoms. Today, blockchain also faces a major problem of scalability. The fastest proprietary blockchain systems currently can handle no more than several thousand transactions per second.2 To put this into perspective, at its peak, DTCC processes 25,000 equity transactions per second. (This is roughly the level of VISA’s payments processing capacity.) DTCC (2018) points out that any new technology would have to have a maximum capacity of two to three times this peak– that is, it would have to be able to handle at least 50,000 equity transactions per second. For the foreseeable future, given physical constraints on the speed of transmission for such a large volume of information, we see no way that the financial system can escape its reliance on centralised clearing and settlement systems. All that said, we really have little idea where this will lead. Nearly a decade since the appearance of Nakamoto’s (2008) paper that launched Bitcoin, we have more than one thousand crypto-clones. But where are the broader applications of blockchain technology? As CLSNet suggests, we expect that it will find increased use in the clearing, payments and settlement system (Cecchetti and Schoenholtz 2017a). Perhaps it also will be applied across a range of other activities, such as recording property titles or managing the supply chain both within and across firms or for a variety of accounting and audit functions. Such applications would likely focus on cases with limited numbers of transactions and where speed is less important. But, for now, we anticipate the development and implementation of proprietary systems, not those with open access.